Peacocks are a beautiful and captivating bird. Their feathers have long been cherished and admired for the beautiful and striking colors. When peacocks shed their feathers they grow back even brighter and more beautiful, thus sustaining the power of the peacock image. This is part of the reason people are drawn to a peacock tattoo. People want a peacock tattoo because they look good. The flurry of bright and brilliant color is attention getting. Peacocks have come to hold meaning as a symbol of accepting one’s own beauty. They are also a sign of authority and a regal manner. People who get a peacock tattoo are likely self-assured and proud. The peacock also holds religious meaning. It is an early Christian symbol for the resurrection of Christ. There are variations of a peacock tattoo. There can be many different colors used and the tattoo can be of a whole peacock or just a peacock feather. 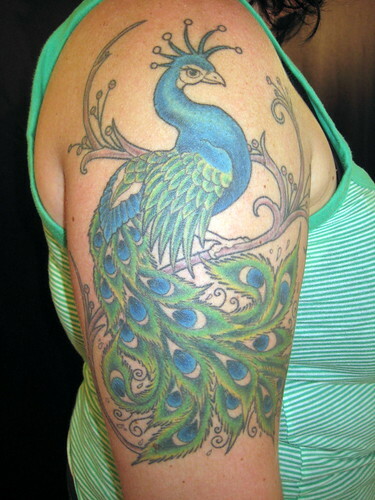 Sometimes people use peacock feathers to adorn other tattoos, as well. The male peacock is the image used since females do not have the showy, bright colored feathers. Peacock tattoos can be put just about anywhere on the body, too. They are a great versatile image that lends itself to be able to be adjusted to fit the desires of the person. Peacock tattoos are a common request. The proud and beautiful peacock is something to be admired, to be cherished. People who want a tattoo that expresses their love of life and show the world that they are proud and happy to be themselves may choose to get a peacock tattoo.